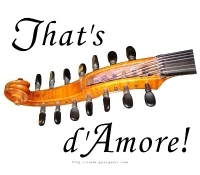 This image of a graceful Viola d’Amore scroll just begs for the caption we’ve given it, “That’s d’Amore!” A great way for the aficionado of this special instrument to display his or her devotion! This is a great design not only for those who play this instrument, but for all lovers of early and Baroque music in which it is used. Buy this design now on a t-shirt, hoodie, bag, clock, mug or other quality giftware or apparel item, exclusively from Bratsche’s Viola Bazaar!